their disinfectants. We can guarantee that Sporekill is safe in this regard. Sporekill is great for cleaning wooden trays. Although plastic can line and protect the bottoms of the trays there is no good way of controlling the moulds on the sides of the boxes. Many of these contribute to spotting and quality loss during the crop. Sporekill has high detergency for penetrating wood and when it dries it seals and traps mycelium and spores in wood thus reducing spores forming on the sides during cropping. 1.5-3 L Sporekill in 200L of water (0.75-1.5%) depending on cleaness of trays. Plenty of volume is important as can be seen on the video. In this farm, the trays are thoroughly wetted down after emptying and left on the yard for a week before reuse. Trays remain ‘cleaner’ during cropping. 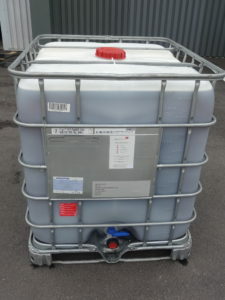 Sporekill is now available in 20L drum size and we will discontinue 25L. Cooking out with steam still remains the safest option when emptying growing rooms. However you must bear in mind that steam will not get your floors to a high enough temperature to kill most mushroom pathogens, which means another strategy must be adopted. One such strategy is using a tried and tested mushroom disinfectant like Sporekill (Nutriclean). It is ideal for cleaning growing rooms; floors, walls and shelving etc. It is, in our opinion, the best solution for floors because after disinfection action it leaves a odourless protective film over all the tiny cracks and holes on the floor surface, sealing any remaining spores and debris settling after filling of your rooms. 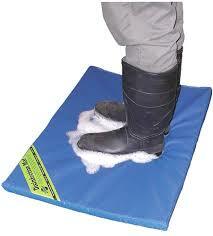 This stops any disease becoming airborne again and leaves surfaces clean and safe for foot traffic and packaging bases. Don’t just take our word for it….our customers are the proof, it’s a fact that once they start using it they rarely change back to any other disinfectant and your mushrooms will never have any unsafe residues in them. We have made a new video presentation about our disinfectant to explain about its benefits in more detail. Please email us sales@nutrigain.com for entry password and then navigate to the folder of interest eg disinfection click on “Staying ahead of risk” video. “Consider what happens after a diseased crop is watered; pools of contaminated water collect on the floor and some at least will dry out. Sooner or later someone will walk on the floor and disturb debris and Verticillium spores lying on it. This type of spread can be prevented by sprinkling SPOREKILL on the floor. It was pointed out to us recently from a long standing user of Sporekill, that he noticed when he took his boots off at the everyday, they were ‘sticky’ and ‘tacky’ on the soles. So the good news is that spores are going to get stuck to the soap matrix on the boots and not spread around the farm. Another great reason for using Sporekill in your footdips. Sporekill is perfect for floors because of it additional ‘sealing’ and trapping action on spores and mycelial debris. It also protects against Listeria which can also be found on floor surfaces.